This week, Disney invited us to experience Toy Story Land during their media event! Disney provided us with park entry, fastpasses, food credits and access to some of the Imagineers that created this immersive land. I am so excited to share all of my Toy Story Land knowledge with you. Toy Story Land is the first immersive land in Walt Disney World. In this land, you shrink down to the size of a toy and play in Andy's backyard. In Toy Story Land there are three attractions, multiple character experiences and a yummy quick service walk up window. 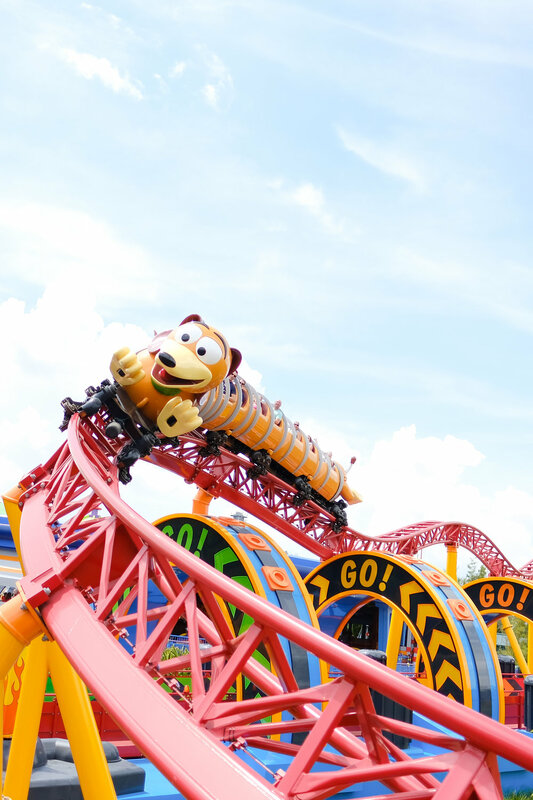 The highlight attraction of the land in my opinion is Slinky Dog Dash a family friendly roller coaster that you seriously cannot help but laugh your entire way through. Make sure you look all around in the queue to see Andy's plans, and supplies for putting this coaster together. The queue is mostly uncovered, until you get close to the front of the line. The coaster is entirely outside so this ride will close for any inclement weather. Guests must be 38" or taller to ride. if you don't have a Fastpass I think this ride IS worth waiting for, but make sure you are lathered up in sunscreen and maybe pack a little fan! Toy Story Mania has been a part of Disney's Hollywood Studios for a while, but they changed up the queue and you now enter in Toy Story Land. (Oh, they also dropped "Midway" from the name.) The new queue is adorable and it's made from mostly game pieces. While the new queue appears to be a lot of outside waiting time from the photo below, even on opening weekend I didn't see people waiting out there. This is a great line to hop in when it looks like it might be about to rain or you need a break from the sun as you will mostly be waiting inside. There is no height requirement on this ride, so everyone can go! With the addition of the new track here, and the fact that most people are going to be waiting for Slinky Dog Dash, I haven't seen this line be as long as it used to be. For that reason especially I think this is worth the wait even if you don't have a Fastpass. Alien Swirling Saucers is the other new attraction in Toy Story Land. My favorite part of this attraction is the music. The Aliens have remixed some of your favorite Toy Story songs and it's so much fun to listen to! Even though the Aliens are crazy drivers I didn't have any problem with motion sickness here. It's more of a whip around ride than a spinning ride if that makes sense. The queue is outside and isn't really covered until you get closer to the front of the time. However the ride is fully covered. Guests must be 32" or taller to ride. If you don't have a Fastpass I wouldn't wait more than an hour to ride Alien Swirling Saucers unless this is your MUST DO attraction or you love the little green aliens! Check out the section on talking to the Imagineers for a fun fact about this ride! Guests can meet Buzz, Woody & Jessie as well as the Green Army Men in Toy Story Land. All of these meets take place outside as of right now. Where to meet Buzz in Toy Story Land - Buzz meets right as you are entering Toy Story Land on the right. You should see his line forming immediately after the "Toy Story Land" sign. You have an adorable background here of Slinky Dog Dash! Where to meet Woody & Jessie in Toy Story Land - Woody and Jessie meet just past the entrance to Toy Story Mania on the left. It's what looks like a giant box of animal crackers. If you were there on opening weekend like we were you might have thought "wow that's such a cute photo area" and you would have been right because that is where they are meeting now. Where to meet the Green Army Men in Toy Story Land - The Green Army Men wander Toy Story Land. There is really no one area they stick to. Over the course of our time there we saw them playing the drums and interacting with guests the entire time. If you want to get a photo with them wait until you see just one or two walking around don't interrupt any play time you see them having! Woody's Lunch Box is a quick service walk up with outdoor seating. There are both sit down and stand up tables located here. Even though this food location is entirely outside most tables have shade and there are also fans around. Breakfast options are served here until 10:30am. The Breakfast options include a S'more French Toast Sandwich (GF allergy version pictured below), a Potato Barrel Breakfast Bowl, Yogurt Parfait and more. After 10:30am, they change to their Lunch/Dinner menu and that is served through park close. Options there include sandwiches, and Totchos, potato barrels topped with chili and cheese. Woody's Lunch Box also has a few items that are available all day long. You can get their signature drink, Mystic Portal Punch which is a Powerade based drink with or without the Alien Sipper cup. Also available throughout the day are the Box Tarts. You can see both of those in the photos above as well. The best part of the Media Event was Disney gave us the opportunity to chat with some of the Imagineers that created Toy Story Land! We also got to chat with Steven from Disney Parks Merchandise and the Food and Beverage team. I loved getting to talk to Steven (is anyone else obsessed with the Disney Parks unboxing videos?!). He was telling us how light up details were such a big part of the products that were created for this land. That's why you see them in the Slinky Dog toy, the Alien headband and the Alien sipper cup. A few of the products created specifically for this land were the toy Slinky Dog Dash coaster and the mini Alien Swirling Saucer cars. The team designing the toys actually used scaled molds that were used for the rides! That's why every detail was so perfect on these products in matching the attractions. Steven also told us that the lead designer of the Slinky Dog Dash coaster toy was so amazed when he got to see the real Slinky Dog Dash in person, and then got to ride it. All this time he had been working on this little toy version of what he was finally getting to experience. We also got to meet and chat with the Food and Beverage Team from Woody's Lunch Box. Most of you know, Cameron has a Gluten Allergy so we eat Gluten Free both at home and in the parks. I asked the team if they consider food allergies when planning a menu or is it just whatever fits in after a menu is planned? They said with how prevalent food allergies are now, that have to take it into consideration. They will do their best to offer an allergy friendly option as long as it doesn't completely change the flavor profile of the dish. They plan to do things, like bake and not fry the potato barrels, that will make it easier for there to be no cross-contamination issues. I also thanked them for making the offerings here more exciting than hot dogs and chicken nuggets, even though those have there place, it was nice to have some fresh and new options here! Another interesting thing we learned from them is that while planning the menu they know exactly how many items there should be based on the number of lines to order. That way the entire process runs smoothly! Of the three or four cast members there representing Imagineering we got to chat with Dave. He was the Head Creative Director of Toy Story Land! It was so amazing to get to hear from him how much love and fun went into this land we were all getting to enjoy. Dave has been with Disney Imagineering for 39 years. His first project was Epcot and more recently he worked in New Fantasyland. I loved how excited he got when he was talking about how much fun it is to watch people enjoying this project they have been working on for so long. Toy Story Land has been being worked on from concepts to what we see now for the past four years! That's a long time to be working on something and hope everyone is going to love it! Dave said they new Toy Story Land was going to be the perfect addition to the park because it spans so many generations. Within the land there is something for everyone to enjoy. There is so much to SEE in this land. After talking to the Imagineers we walked back through and took a fresh look at everything. Each piece placed in this land has meaning and thoughtfulness behind it. The entire land is laid out in the way a child would play with his toys. One of the things that was pointed out to us was look for all the random pieces that appear to be "dropped" here and there in the land. It's as if Andy's mom called him before he was totally done building something and he left things kind of everywhere, just like a little kid would do. Getting to meet the people creating the experiences we enjoy in the parks was life changing for me. I won't ever look at Toy Story Land the same way again. I don't think I will ever stop being in love with Toy Story Land. Thank you so much again to Disney for inviting us on this Media Day!